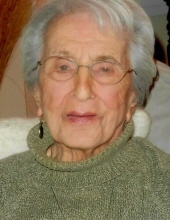 Sylvia L. Welkie, age 97, of Knox, passed away peacefully at her home on Tuesday, January 29, 2019. Sylvia was born March 23, 1921, in Knox, to Jerry Gurrado and Mary D’Errico Gurrado, both deceased. In 1946, on her 25th birthday, she married Elvin H. Welkie. Together they owned and operated two local businesses, Welkie’s Dry Cleaners and Elvin’s Bar (now O’s Tap). Elvin preceded her in death on July 10, 2005. In her active lifestyle, Sylvia loved bowling, golf, playing bingo, going to the casino, and beating her sisters in cards. Her family meant everything to her. Sylvia was a member of the Knox VFW Women's Auxillary and the Knox United Methodist Church. She is survived by her daughter, Debbie Bennett (Neil) of Louisville, KY, 2 grandchildren, Kevin Bennett (Kelli) and Erin O’Brien (David), 4 great grandchildren, Landon and Norah Bennett and Colin and Anna O’Brien, and 4 sisters, Doris Ghimenti of Carbondale, IL, Edith Gurrado of Knox, Geraldine Baske of Lacrosse, IN and Mary Jane McDonough of Joliet, IL. She was preceded in death by brothers, Mike, Frank, Albert & Joseph Gurrado, and sisters, Lorraine Gurrado and Maddaline Pitts. Funeral services will be Monday, February 4, 2019 at 1:00pm (CT), with visitation beginning at 10:00am (CT) at M.C. Smith Funeral Home. Burial will follow at Crown Hill Cemetery in Knox. Memorial contributions may be made to the Knox United Methodist Church. To send flowers or a remembrance gift to the family of Sylvia L. Welkie, please visit our Tribute Store. "Email Address" would like to share the life celebration of Sylvia L. Welkie. Click on the "link" to go to share a favorite memory or leave a condolence message for the family.